All The Pretty Dresses: Edwardian Women's Swimsuit! 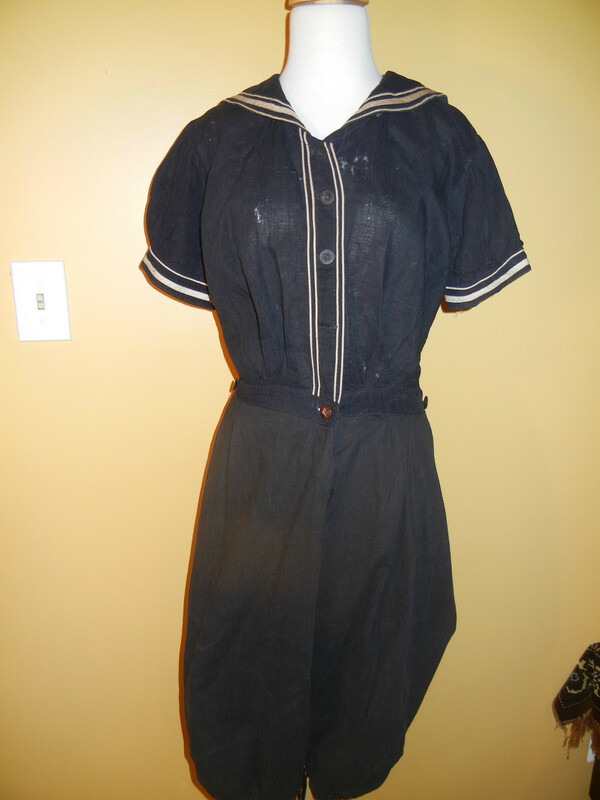 This is an antique women’s bathing suit that I believe to date from the mid to late 1800’s in good condition. It’s lightweight navy cotton with ribbon stripe details along the collar, sleeves, and skirt waist. The front closure is 6 buttons, one of which is missing and one has been replaced but the original buttons could be easily matched for replacement if you desire. 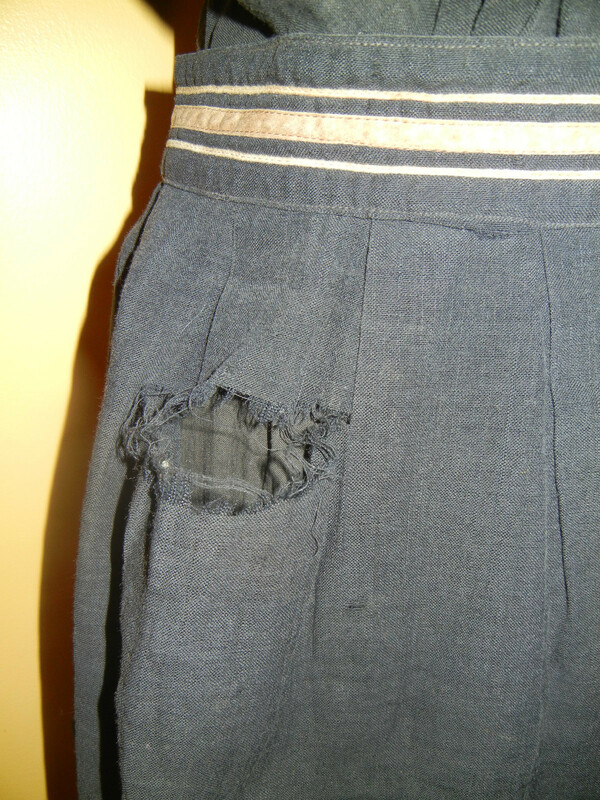 The cotton has a few places showing wear and a few holes, a few in the back between the shoulder blades, one on the chest to the left of the button closure, a few small pinholes scattered throughout the back and the left leg of the bloomers and a small separation along a seam at the bottom of the left bloomer leg. 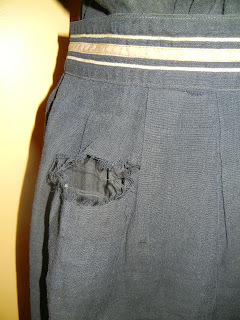 The skirt has one large tear on the hip, one smaller hole about midway down the skirt, and a few more pinholes that are unnoticeable unless held up to a light. 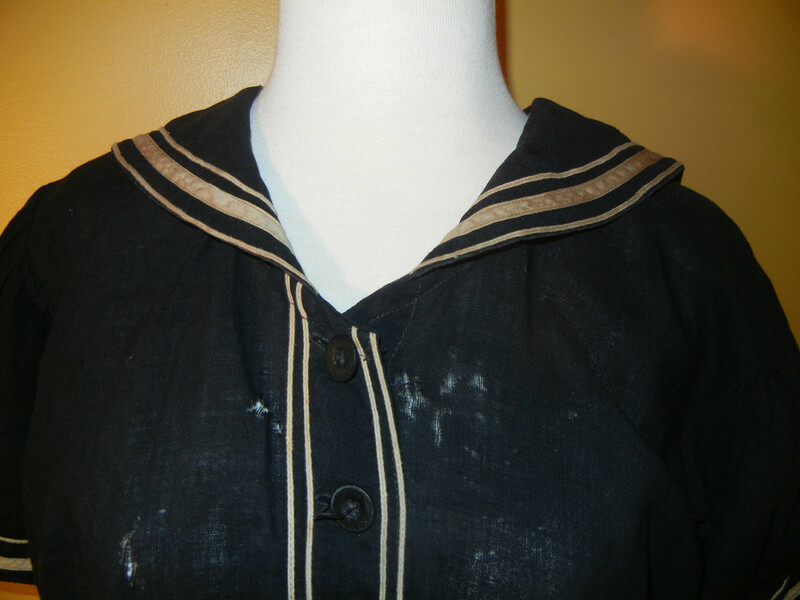 There is one light colored stain on the skirt that would probably come out with a cleaning (pictured.) 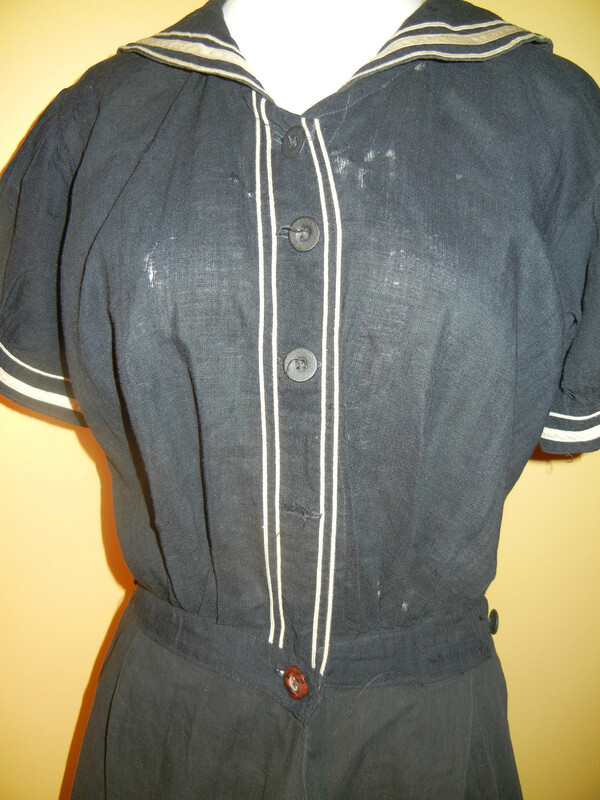 These could all be easily repaired in the right hands. The set is in rather rare condition for its age. The skirt attaches to the bloomers with two original buttons on either side that fit into button holes on the skirt and the bottom cuffs of the bloomers are drawstring closures, the strings resemble shoestrings but appear to original. 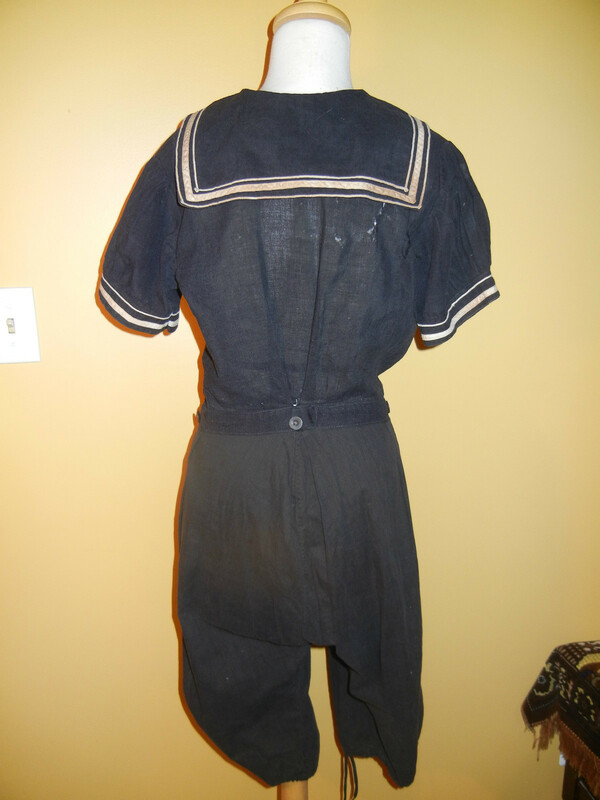 The size label on the set is missing but lying flat the bloomers measure 20” across underneath the arms, 42” from shoulder to bottom hem, 14” across the waist, the sleeves are 7 ½”. 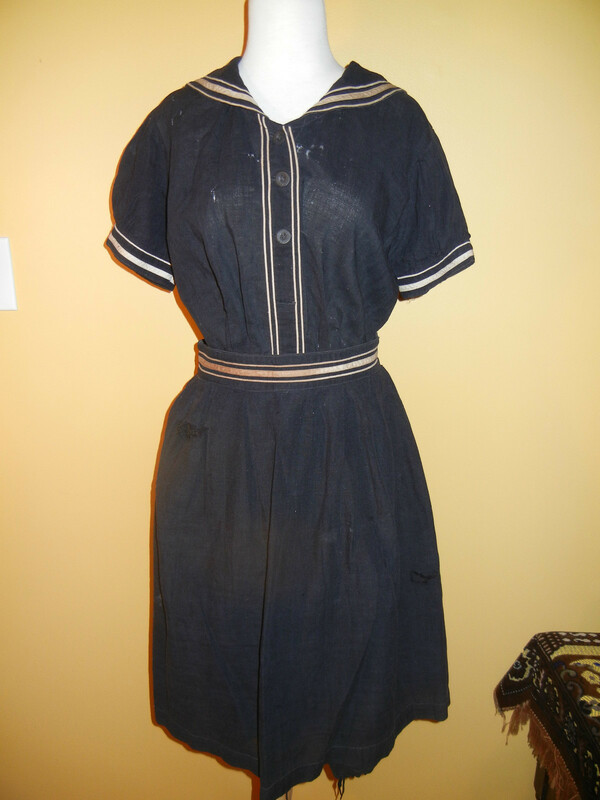 The skirt measures 14 1/2'” across the waist and is 26” long.